Brainwashed - Black Spirituals, "Black Access/Black Axes"
Black Spirituals, "Black Access/Black Axes"
As the pairing of drummer/percussionist Marshall Trammell and Zachary James Watkins on guitars and electronics, Black Spirituals has had a short, but overwhelmingly brilliant run of experimental albums. Black Access/Black Axes represents the final release in this arrangement (Watkins will be continuing to use the name, however, but with different collaborators), and also a band at the their peak. Drawing from the worlds of noise, jazz, and rock—but never easily settling in to any of those more limiting genres—the album instead encompasses everything, and makes for one of the most multifaceted, and amazing, albums so far this year. There are distinct themes of reappropriation and decolonialization throughout the record, which are all clearly aligned with the roughly defined styles that make up Black Access/Black Axes. First, the jazz influences in Trammell’s drumming and the subtle rock and roll elements in Watkins’ guitar work echo two styles of music that were initially Black creations, but later co-opted (and in many cases diluted) by White artists who profited on their imitations. Here those signifiers are presented in a unique, fresh context that neither fully sound like their original forms, nor their distilled modern interpretations, but instead something entirely new and unique. More subtle, in my opinion, would be that these jazz and rock tendencies are recast in an overall more avant garde and experimental context. The former has too often been within the purview of snooty academia, limiting both race and social class among its earliest practitioners. The world of noise, however, ends up being the most damning, with its use of provocative themes that have too often embraced fascism, bigotry, and misogyny. Either way, both styles have never been anything close to inclusive, but Black Spirituals' work sonically fits into both, but also transcends such a label. It may seem like a minor detail, but it is an important distinction: Black Spirituals is not a duo, but a duet of two soloists working together. Meaning that, any one of the ten pieces spread across the two records could be either just Trammell or Watkins' work absent the other, and would still make for a powerful record. This fact is made apparent towards the middle of the album, with "Want" being largely understated electronics and field recordings (Watkins' specialty), before immediately transitioning into the rapid, amazingly complex solo drumming of Trammell on "Anti Up". When the two are performing together, however, the final product is even more marvelous. The noisy opening and feedback squall of "Inference" heralds Trammell’s hyperkinetic drumming, a tight, dynamic pairing of dissonant elements that are soon melded together by Watkins’ guitar, which drifts between aggressive squeal and melodic motifs. Surging electronics and lighter rhythms open "Treatment" on a more calm, meditative note, but the two dial things up in time, with the drums becoming faster and more intense, and electronics and guitar getting grittier and rawer with each passing moment, reaching a pinnacle of organized chaos before then rolling back. The calmer moments on Black Access/Black Axes are no less essential either. "Condition" may open with an aggressive electronic buzz, but Watkins keeps some shimmering lighter tones deep in the mix. Trammell’s drumming is a bit more restrained tempo-wise and it makes for a greater sense of tranquility throughout. The first half of "Dissension" is also somewhat peaceful, with a well-controlled electronic drone and sparse, intricate drumming throughout. Afterwards, however, it starts to build, with the rhythms becoming gradually louder and more forceful, and soaring improvised guitar leads. While I am sad to hear that this will be the final Black Spirituals record in this configured, it cannot be argued that in this duet form, Marshall Trammell and Zachary James Watkins are going out at the top of their game as performers and collaborators. 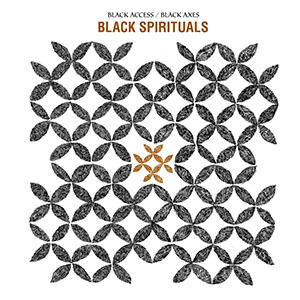 Black Access/Black Axes is a wonderfully multilayered record that covers everything, from meditative complexity to the undeniable joy that loud, distorted electric guitars can bring. Which is another defining facet of this record: the spirituals part of the project’s name is quite descriptive, because even among the noise, distortion, and pounding rhythms, every song here is imbued with a sense of joy and celebration. Even within the ever-declining American social climate that Black Spirituals draws from here, there is an undeniable sense of positivity, strength, and joy. Black Access/Black Axes is a massive record, and one that is easy among the best I have heard in years.